Entering this course, I was unsure what I would get out of it. I am not particularly interested in ICT or ICT interventions in development. I think I expected the course to focus mainly on ICT4D projects alone. I am happy to say that I was wrong in this assumption. This course has forced me to think critically about the role ICT plays in every development project. It is important as a hopeful international development professional to consider all aspects of interventions and adjust as appropriate. When living in such a technology dependent and abundant society, it can be easy to take it for granted. Development professional must not only think about what technology a community may need for their own growth, but what technologies the individuals and organizations will need to achieve their goals and complete their project. Perhaps one of the most important lessons is that ICT4D is all encompassing – it is not just an end, but also a means to reach an end. ICT4D means both enhancing and improving access to technology for development, but also using ICT for the successful implementation of all development projects. It was especially interesting for me to take what we learned in class and apply my experiences abroad last semester in Thailand. I found it easier to internalize and think about these big issues and how they manifest in different countries. I appreciated all the different theoretical frameworks we looked at, because I think it is important to understand how development professional think about development and solutions, as well as formulate our own opinions about the different frameworks, what they mean, and the best way to approach the field. I think that capabilities approach and Human Centered Design are incredibly important and are on the right track to the way development should be approached. With so many failures, it is imperative that we are critical about what works and what doesn’t. Development professionals should also place an emphasis on valuing the local culture, knowledge, tradition, wisdom, and wishes of whatever community they are working with. This helps ensure that projects are successful and appropriate. In future semesters I think it would be interesting to look at ICT in civil society and how NGOS, non-profits, and civil and social organizations can use ICT in developing countries. In class on Thursday, our guest speaker Ralph Russo gave an informative, engaging, (and a little bit terrifying) presentation about cyber security. It brought up a lot of questions about the internet, regulations, cyber terrorism, and cyber security. With legislation being drafted to try to increase the government’s ability to monitor information on the web, many people are becoming increasingly interested in this topic. One thing Ralph Russo mentioned was that there was no way to regulate the internet. Which makes sense – with all the users and information out there, how could it even be possible? However, it seems that China is – or trying to – regulate and monitor all internet use. Under strict censorship and other laws that control the media, China tries to protect the information that goes in and out of the country, as well as keep a hold on their regime. For example, China logs every IP address to your personal information – Chinese and foreigners alike. In the Beijing airport, I was required to scan my passport and register my IP address in order to access the free WiFi. Apparently, some websites are restricted for viewing and some websites even redirect to the Chinese government websites (a tactic that Iran is now using). A new agency was just formed to further regulate and enforce internet censorship. This seems to contrast what Ralph Russo was saying. What is correct? Is China actually able to monitor and regulate the internet like they say? Or is it simply a dream and a large effort that cannot be reached? This week we talked a lot about the best and worst practices of ICT4D projects and FailFaire. A classmate rightfully pointed out that most projects we talk about and look at are failures, and it seems to be difficult to find good examples of successful ICT4D projects. Many are familar with Stephan Covey’s 7 Habits of Highly Effective People, and I bring to you the 12 Habits of Highly Effective ICT-Enabled Development Initiatives from Bridges.org. I found that these 12 Habits are all good examples of best practices for creating a successful ICT4D initiative, and are consistant with what we have talked about in class. Bridges.org does a good job of describing each habit and their importance, as well as providing the questions you should be asking your self each step of the way. Start by doing some homework. Look at what has worked and what has not worked, study good practices in the area, and build on what you have learned. Conduct a thorough needs assessment of the community to be served so you can plan to do what is actually required. Make it local: ensure local ownership, get local buy-in, work with a local champion, and be context specific. Engage a local problem-solver with some degree of responsibility, and involve them sufficiently so they can identify and address problems as they arise. Form sound partnerships and collaborations, and be good partners and collaborators. Set concrete goals and take small achievable steps. Be realistic about outputs and timelines. Found your initiative on technology-neutral concepts so it can be adapted as needed to accommodate technology change over time. Identify and understand the external challenges you face, and take practical steps to address them. Monitor and critically evaluate your efforts with effective tools, report back to your clients and supporters, and adapt your approach as needed. Make your initiative sustainable over the long term — either by bringing in sufficient income to be self-sustaining, or by delivering on a social mission so effectively that it is worthy of continued donor funding. Widely disseminate information on what you are doing and what you have learned so others can avoid your mistakes and build on your efforts. Most of these habits seem obvious and have been mentioned and talked about both in class discussions and readings. I found Habits 7, 8, and 12 especially interesting. In Habit 7, it is pointed out that since technology is constantly changing, it is important not to get locked down on a specific technology as well as making sure that technology chosen can “stand the test of time.” Choosing “technology-neutral” approaches will leave wiggle room for the project to adapt to any changes in technology. Habit 8 specifically targets the digital divide, and that initiatives should aim to include groups that are marginalized. It is easy to assume that ICT4D initiatives inheritly work to close that gap, since the target groups are the poor, discriminated, and marginalized, however it is important to remember that each nation and each community will have their own marginalized populations, and ICT4D initiatives should work to close that divide as well, not just the divide between the developed and the developing. Habit 12 urges professionals to share their projects, successes and failures so that all those in the field may learn from them. This Habit connects “full circle” to Habit 1, which calls for initiatives to build on past projects. In a field where there seems to be so much failure, there is certainly a lot of room for growth and learning, which professionals seem to try and encourage from each other. This is a field where a win for one, is a win for all, and everyone must work together to achieve the greater goal. The 12 Habits can help direct and focus project designs, and can be used to hold organizations accountable. While there are many “best practices” and “checklists” (such as that in the Plan International article), I found this list to be one of the best that I’ve seen. It is honest, practical, and thoughtful, and goes beyond the simple steps for drafting a project. In an earlier blog post, I talked about Thailand’s ICT usage and found that Thailand has a higher usage than many developing countries. 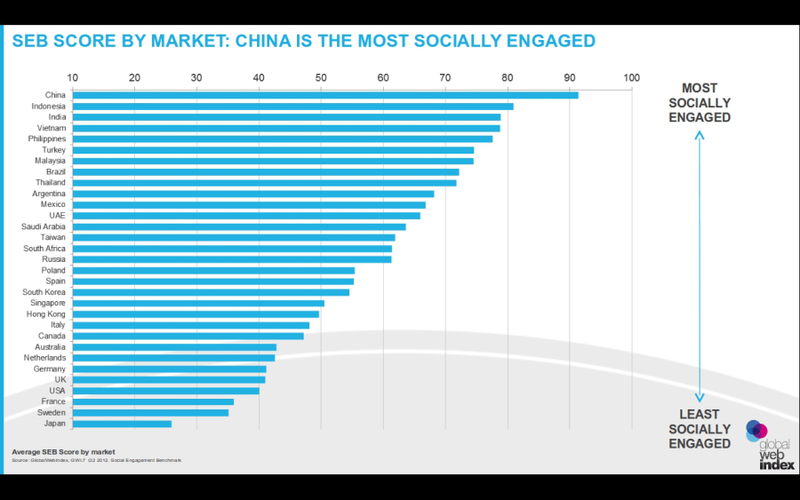 Unsurprisingly, Thailand is also very active in social media. Thailand has a population of approximately 69 million people. About 30% are online, according to Internet World Stats. comScore reported that social networking is used by 96% of internet users and accounts for 30% of all time spent online in Thailand, with the third top website visited being Facebook. As of February 2013, there are over 18 million Thai facebook users, which ranks Thailand 13 in the world. Thailand has added over 1,000,000 new Facebook users in just the last six months. Twitter and Instagram are not as popular, with only 1.5 million Twitter accounts and 800,000 pictures on Instagram with the hashtag “#Thailand.” Thailand’s Facebook usage is extremely high – 74% compared to 47% in Italy, according to GlobalWebIndex. Many attribute the large growth and use of Facebook in Thailand to gaming – a huge industry in Thailand. Many young Thai’s also enjoy Facebook for connecting with friends and sharing pictures. Social media is being used by the Thailand Department of Tourism to promote special events, festivals, and to attract tourists. 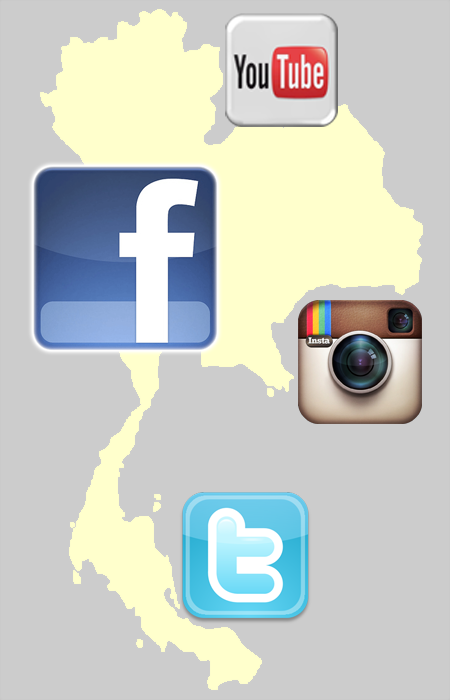 Additionally, social media has played a role in natural disasters in Thailand, such as the floods in 2011. Social media sites helped Thai’s relay important information to their networks, which both helped save lives and keep the public informed, but attracted many more users, says reporter Michelle Fitzpatrick. Social media also plays an important political role in Thailand, helping connect activists and spread awareness. This is especially critical and sometimes dangerous under Thailand’s strict lese-majeste laws, for which the punishment is 15 years in prison. Social media is starting to play a larger role in elections, however due to political tensions, it is often monitored and censored during elections. 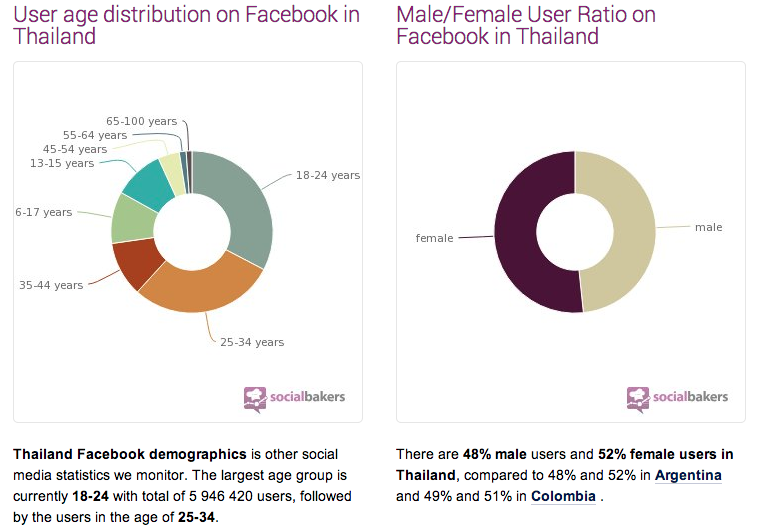 Overall, Thailand’s social media use is impressive, especially for a developing country. The usage is growing and shows a lot of promise and potential. I think one of the most important and critical applications of ICT is for disaster management and mitigation. With the proper infrastructure, monitoring, and implementation, ICT for Disasters can save countless lives and speed up the rebuilding and recovering process. As a case study, I am going to use our location – New Orleans, Louisiana – where we face the very real threat of hurricanes. One of the most important steps anyone can take to mitigate the effects of disasters is preparation and preparedness. Check out Get A Game Plan from the Louisiana Governor’s office – it has plans and essential info to get you prepared for the next storm. You can also download the app on your iPhone! Public campaigns through TV ads, Internet, Texts, etc can deliver helpful information and reminders. Early warning systems (EWS) are key in making sure that people know when disasters are coming and what precautions to take. EWS can be traditional (alarms, radio, TV, telephone) or modern (SMS, Internet, Apps). With NOLA Ready, New Orleans residents can sign up to receive notifications via text, email, or phone call for evacuation information, weather advisories, infrastructure issues (water advisories, power outages), and traffic. Have an iPhone? With the WDSU Hurricane Central App, you can track tropical storms and hurricanes with satellite maps, up-to-date notifications, preparation checklists, and planning maps. During a disaster, apps on your phone and other ICT options can keep you informed and safe. They can also help connect you to loved ones. Did you know? During Hurricane Katrina, phone service was limited or unavailable, but SMS often still worked! This is because SMS works on a different band, and can be sent and received even when service is down or congested. Another plus is that you can text multiple people at once, which will save you battery power. In the aftermath of disasters, online databases (check out Sahana) can help with missing persons and connecting people to NGOs and resources. Satellite images can help identity damage and find those in need of help. -ICT usually requires a power source, which can be cut off during an emergency! Back up batteries or generators are suggested. -Not everyone has access to ICT! -People have to use it! Having ICTs in place does no good if people do not take advantage! Do you know of any tools and tips that I missed? This week, we looked at an article that highlighted gender inequalities in ICT usage in African countries. While the numbers were interesting and usage was low, it described a greatly different picture than what I had experienced during my time in Thailand, and therefore does not tell the whole story of ICT and gender in developing countries. Even while living in rural Thailand, in the poorest region of the country, it seemed that technology was everywhere. Everyone had a mobile phone – and this includes those living in villages with no electricity or running water! Internet cafes were extremely popular, and you could get free wifi at every restaurant, tea shop, cafe, and even markets. TVs were a HUGE part of Thai culture, every household had a TV and it was turned on every night for hours. At the University, every student had laptops and cell phones, and sometimes even an iPad too. My Thai roommate had a Blackberry, iPad, TV, and laptop! There were entire malls dedicated to technology sales – computers, phones, etc. Facebook is HUGE, and everyone had one – even my homestay brothers and sisters in rural villages, giving an indication of what Internet access might be! Gender did not seem to be an issue, in fact, it almost seemed as if females had more access and were using technology more! If you compare my observations to what the study of African countries, there couldn’t be more of a contrast. 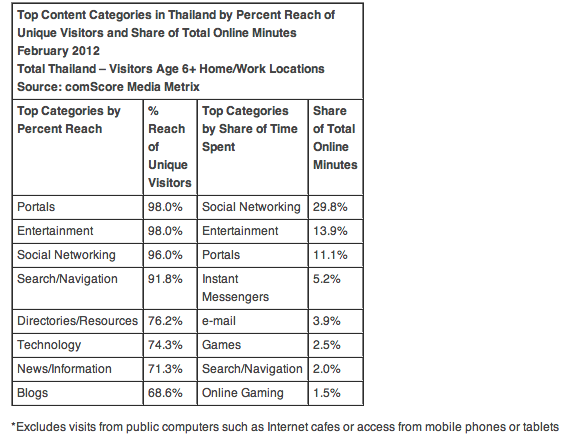 To make sure my experiences weren’t completely off base, I did some research on ICT usage in Thailand. And guess what? There are more mobile phones in Thailand than there are people! 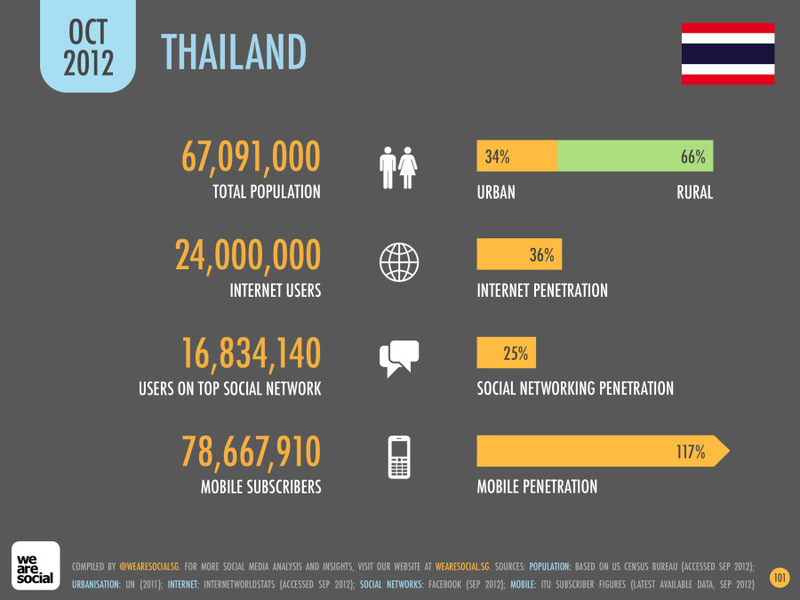 Thailand’s overall internet penetration is 27%, but those who are connected to the internet are using it 50% more than TV (http://wearesocial.net/blog/2012/01/social-digital-mobile-thailand/). 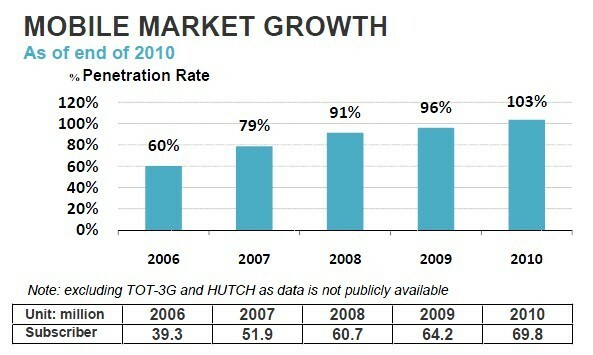 Besides there being more mobile phones than people, the mobile market is over 100%! A survey showed that, 91% of Thais surveyed reported that they had used a cell phone in the last three months and that 90% of women had cellphones, compared to 80% of men (http://www.nationmultimedia.com/life/How-the-poor-use-cell-phones-30173682.html). 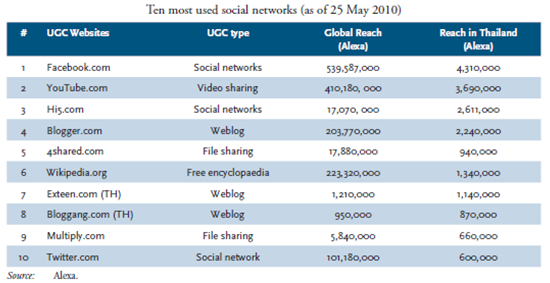 Check out the data below from a UN report from the International Seminar on Information and Communication Technology Statistics in 2010. The region I stayed in was the Northeast and is the rural and poor in the nation. Source: Santipaporn, S. (2010). 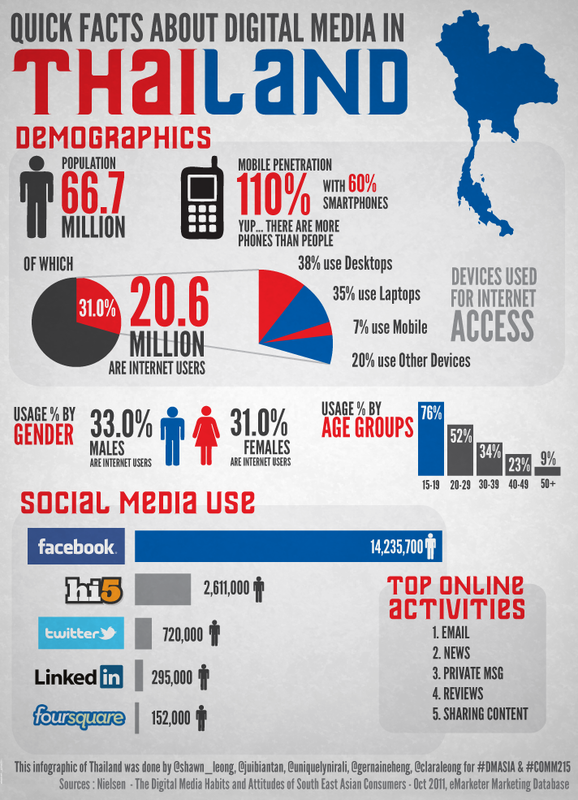 Information and Communication Technology Statistics in Thailand. National Statistical Office. Santipaporn, S. (2010). 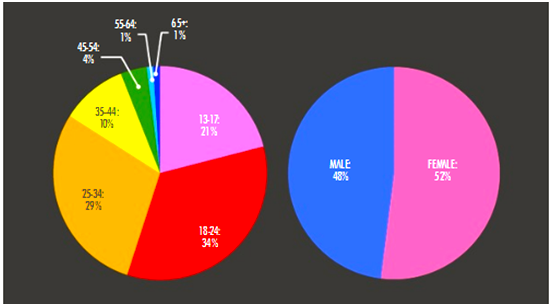 Information and Communication Technology Statistics in Thailand. National Statistical Office. Needless to say, I wasn’t surprised by the numbers I found. Do any of these numbers shock you?